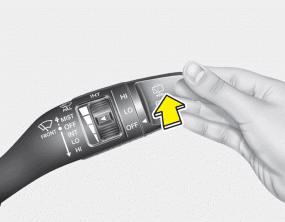 The rear window wiper and washer switch is located at the end of the wiper and washer switch lever. 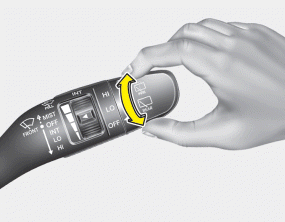 Turn the switch to the desired position to operate the rear wiper and washer. Push the lever away from you to spray rear washer fluid and to run the rear wipers 1~3 cycles. The spray and wiper operation will continue until you release the lever.